The Jesus trail bike tour is accompanied by an accomplished guide and expert rider. The basic route is three days long however, athletic and experienced riders can complete the tour in 2 days although a four day option is also available for a more leisurely trip. mountain bike tour on three riding days, minimum three people in group. If minimum group size is not met four weeks prior to start date, tour will be cancelled or there will be an option to run the tour at a higher rate. 4-7 nights depending on the group's desire. Arrive in Nazareth in the evening and settle into the tranquil old-world ambiance of the Fauzi Azar Inn, a restored 18th-century Arab mansion, replete with painted ceilings and marble floors. Relax with sweet mint tea in the common room and meet other travelers. 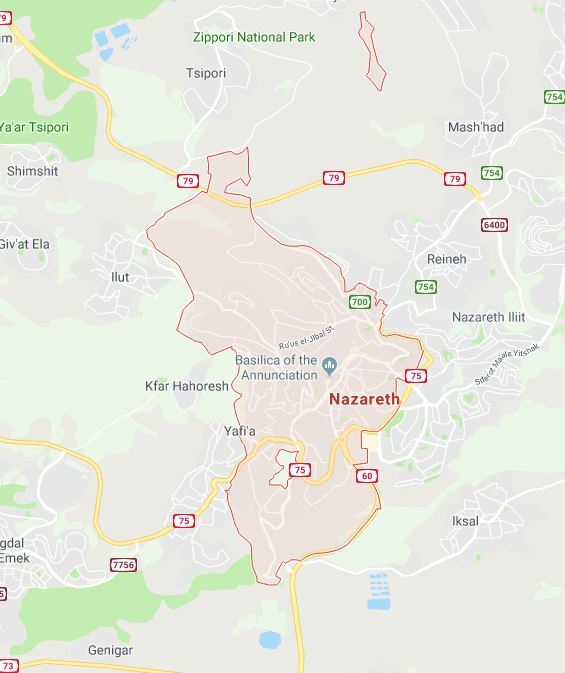 Enjoy dinner at one of Nazareth’s many fine restaurants (not included in package cost). Before breakfast, meet the bike staff and tour guide to arrange all the bike equipment for the ride. Eat a traditional Arabic breakfast of fresh pita bread, salads, cheeses and eggs. Carry water and a packed lunch with you– the rest of your luggage will be transferred to your accommodations. Ascend out of the old city and ride through calm pastoral fields to Zippori National Park to visit the archeological ruins of the main administrative city in the Galilee at the time of Jesus. Admire the exquisite Byzantine mosaics, drink in the view from atop the Crusader fortress, and take a stroll through the ancient cistern system. Take a break and refill your water before returning to the trail through the small village of Mashhad to arrive at Cana, traditional site of Jesus’ first miracle. Take a rest and have a snack before visiting the Orthodox and Catholic churches commemorating the water to wine miracle. Continue your ride along a forest ridge with peaceful valley views. Stop for a break in a pleasantly shaded forest. Visit a nearby ancient Roman road (5 min from route), part of the Via Maris that connected the Mediterranean to the Sea of Galilee. Ride up a pleasant hill dotted with ruins, to arrive at Kibbutz Lavi, one of very few religious Jewish kibbutzim in the country. Enjoy the swimming pool and peaceful grounds and a kosher buffet in the dining room. Meals included: breakfast and dinner. Note: some sections of this day have domestic and industrial trash along the trail; cleanup efforts are in progress. Eat breakfast and head out across agricultural fields to ascend the Horns of Hattin– a volcanic structure where a famous Crusader battle took place. Relish your first glimpse of the Sea of Galilee and the sweeping views into Arbel Valley. Continue down the rocky hillside towards Yavniel Valley. After a pleasant descent towards the Yardenit Baptismal Site, a baptism site located along the Jordan River that is frequented by Christian pilgrims. Then have a comfortable ride along the Jordan River shore to the “Peace Island,” a site on the border between Israel and Jordan where the Yarmouk River flows into the Jordan River. A hydroelectric power -plant has operated in Naharayim since 1932. We will end the ride at pleasant hotel ‘El Mul Golan” in Kibbutz Shaar Ha-Golan. , with a tasty dinner in the kibbutz dining room. Arbel Cliffs. Now we have stunning single track downhill to the sea. before continuing to Tabgha via rolling agricultural land. Explore the mosaics at Tabgha, the traditional site of the feeding of the 5,000. Continue around the northern side of the Sea of Galilee to visit the church of St. Peter.. Finish your journey at Capernaum by wandering the ruins of the city that was the center of Jesus’ ministry, and spending a moment of prayer in the church built over the home of Simon Peter.. Meet the shuttle for transportation to Tiberias, which has many accommodation options and further transport connections.